The Rancilio Silvia Espresso Machine V3 is one of the most popular home espresso maker in the market. It is a semi-automatic that packs the power of a commercial espresso machine into a compact home system. Many home baristas swear by its ability to deliver premium coffeehouse espresso and we’re just itching to find out whether this claim is true. Rancilio is a highly respected producer of both home and commercial espresso machines, so naturally, we have high expectations for this one. Moreover, it is touted as the “Mercedes Benz” of home espresso makers, so we felt compelled to put that haughty claim to the test and give it a run ourselves. Few people also call it simply as Rancilio Silvia or the V3, so don’t get confused within these. The Silvia is sleek and attractive with a sturdy stainless steel casing that will look great on your countertop. The amount of brass used in the Silvia gives the parts excellent heat retention, which is important for temperature consistency in delivering the best espresso shot. Clean up is easy with the Silvia. Ground residue discharges cleanly from the portafilter and the Silvia also automatically vents through the water tank so you won’t have to worry about emptying the drip tray. It also comes stock with a non-pressurized portafilter insert so you can brew regular coffee using your manual espresso maker. Its water container is quite large, so you won’t have to worry about refilling too often, plus you might have enough hot water left over for tea or more coffee! The steam wand is highly effective and with the correct technique will deliver beautiful, silky microfoam that is perfect for making latte art. It has a convenient holding area for espresso cups on its top so the cups will be heated for optimum temperature consistency. The parts in this espresso machine are the same grade as high-end commercial machines, making it very sturdy and long lasting. The Silvia will provide high-quality espresso, rivaling that of more expensive commercial-grade models. You will get a wonderful espresso with a rich aroma and flavor, palatable consistency with lots of crema too! It is quite pricey ranging from US$650 up to $1000 depending on the vendor. You have to spend a lot of time tinkering with it to achieve the right conditions for your best espresso. If you are not a patient person, this machine may leave you feeling frustrated. It takes a lot of attentiveness to get the optimum temperature. You can avoid the trouble of temperature surfing by investing in a PID kit, which is another added cost. It takes a long time to “warm up”, at least 15 minutes before the steam pressure is built up adequately. Need add-ons for best operation including a PID kit, pod adapter kit, good quality tamper, and grinder. This will easily double the original cost. It’s a good option for the riches who don’t have to worry about bucks. The Rancilio Silvia Espresso Machine V3 is a solid home espresso machine that will produce premium espresso and silky microfoam for your cappuccinos and lattes. It has solid construction, with all the important components that a serious home barista may need. For what it offers, the price is fair. If you have little or no experience with home espresso making and are an impatient person then this machine is probably not for you. The Silvia will deliver excellent espresso and microfoam, but only under optimum conditions. If you want a great cup of espresso you have to do your part too. You will get back what you put in with this machine. So be sure to use fresh, high-quality coffee beans, use a good grinder and consider investing in a PID kit and new tamper for best results. Also, the Silvia is an awesome machine, but it will work like charm with the add-ons. 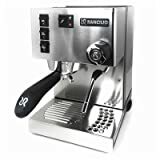 With a little bit of practice and premium raw materials, you will easily get wonderful espresso shots and silky microfoam out of this espresso machine.